And it’s true. The Kraken’s gaping maw of teeth, and the ability to destroy whole cities, lives on in that madman’s mind, Hamtun’s creator Ross Davis, and the H2 dive watch named humbly, The Kraken. If you were waiting to back the H2 for a more convenient time, if you thought you’d hold out just a little bit longer, stop. Don’t. There is no better time. No nonsense: this is what you get. Automatic – Titanium – Sapphire crystal – 200 meters of water resistence. 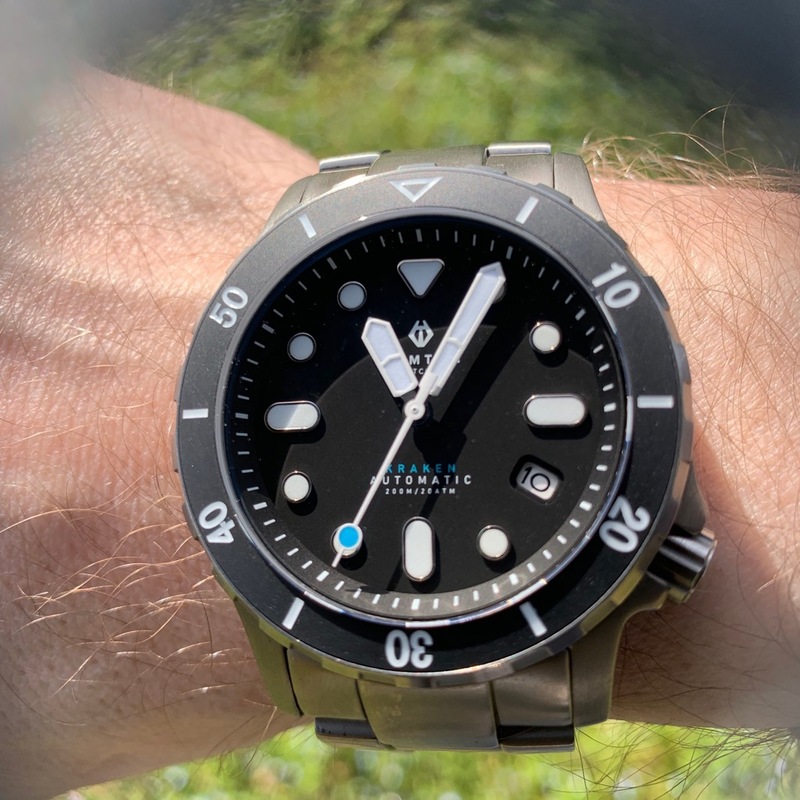 For your support, you will be handsomely rewarded with a titanium dive watch powered either by the competent and affordable Seiko NH35 movement, or for the truly handsome, best-dressed, and well-manicured among you, the Swiss Sellita SW-200 movement will drive the hands around the dial. It isn’t thin, but it’s a perfectly normal dive watch height. 13.9 mm from back to crystal. As for dials, there’s a black dial with white indices, a white dial with white indices, and thanks to other backers who came before you, a meteorite dial has been unlocked, where Ross Davis (not personally, mind you; he wouldn’t want to break a sweat) slices a piece of rock that has fallen from the far reaches of outer space into a thin wafer, just for your watch. Each one is unique, and special, just like I thought I was when I was in high school. The view from the wrist profile. The crystal is ever so slightly proud of the bezel – just like Ross Davis. The clasp is signed with Hamtun’s logo. Forgive the scratches, this watch has been passed around reviewers a bit. It’s well-traveled. Who we think it might be for: You like want a titanium dive watch that’s reliable and affordable. Would I buy one for myself based on what I’ve seen? : That date window. That blue on white dial. You bet I would. If I could make one design suggestion, it would be: not today. I enjoyed the details here, and I’m not even that big a fan of crowns are 4 o’clock. Okay, okay, I wish the bezel teeth were more tightly spaced together. That’s my preference. What spoke to me the most about this watch: It’s all there. The easy to turn bezel with not a lot of backplay, the date window recess, and tasteful color choices. I like this dial much more than I did the H1 indices.